Top seed, the host nation’s Vladimir SAMSONOV won the Men’s Singles title at the GAC Group 2014 ITTF World Tour Belarus Open. Japan’s Sayaka HIRANO won the Women’s Singles title. Playing in Minsk, Vladimir SAMSONOV accounted for Poland’s WANG Zengyi, the no.4 seed, to secure the top step of the medal podium. Extolling his classic control over a table tennis ball to great effect; he withstood the fast close to the table barrage of attacking options from the Polish pen-holder to record a five games win (11-6, 11-4, 8-11, 11-3, 11-6). 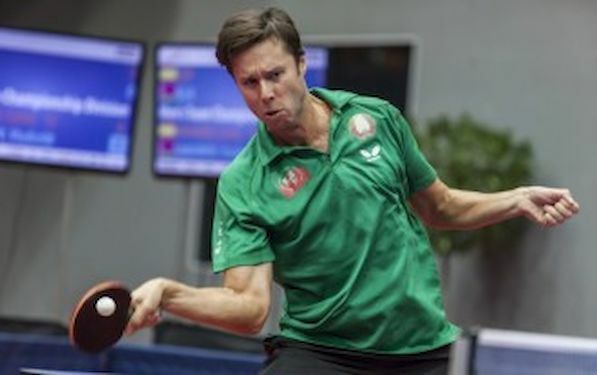 Vladimir SAMSONOV was playing in no less than his 34th ITTF World Tour Men’s Singles final. It was the 24th time that he had emerged successful since making his debut in the very first year of the ITTF World Tour in 1996, when he appeared in Bolzano at the Italian Open. Notably on that occasion he won as well! Prior to today’s win; his most recent ITTF World Tour Men’s Singles was in July 2011 in Morocco. The no.2 seed, Sayaka HIRANO resisted a spirited fight-back from her compatriot, Misaki MORIZONO, the no.5 seed, before being required to perform a recovery of her very own. Sayaka HIRANO won the first three games, she led 10-8 in the fourth; two match points. Incredibly Misaki MORIZONO won the next four points and then with increasing self-belief secured the next two games to force a decider. In the vital seventh game, at the change of ends, Misaki MORIZONO led 5-1; then lost the next six points to trail 5-7! The momentum of the contest had swung inexorably; Sayaka HIRANO established a 10-7 lead, Misaki MORIZONO then mounted yet another recovery. She saved two match points but she could not save a third. Eventually, Sayaka HIRANO won in seven games (11-9, 11-6, 11-9, 10-12, 5-11, 6-11, 11-9).